Chill hours are the total number of hours below 45°F and above 32°F during winter while the plant is dormant. Not all plants have a chill hour requirement, but for those that do, if they need more chill hours than your location provides, they may not bloom or set fruit. Southern Arizona and Southern California usually provide no more than 300 chill hours. Some locations have late frosts after a warm period in the spring. These frosts can destroy the buds on early blooming plants and severely reduce fruit production. There is also a trade-off between bloom times and chill hours. With some fruit tree varieties, late-blooming plants need longer chill hours. The average chill hours and last frost date for your location will help determine which plant variety is best. Some fruit plants set fruit automatically without pollination and produce fruit that is seedless or with non-viable seeds. Other fruit plants are able to self-pollinate and do not need pollen from another plant. These are often labeled as self-fruitful. Many plants, however, require a different cultivar as a source of pollen so each can pollinate the other. Still others simply need a second plant of the same variety. A few cultivars do not produce pollen at all and are dependent upon another plant that does. Finally, some species have male and female flowers on separate plants and both must be present. To sum up, you may need to purchase two plants rather than one unless you are sure that you have a plant that is self-fruitful. Another factor to consider when choosing a fruit-bearing plant is the number of years between planting and when the first fruit will appear. Generally, plants grown from seed can take the longest time to produce fruit. Plants grafted onto a special rootstock, and plants grown in nurseries for several years and sold in larger containers, will fruit years sooner. It can be hard to get at the fruit at the top of a 25' full-sized tree that has not been pruned to control its height. Some ways to control the size of a fruit tree without pruning are to use (1) genetic dwarf trees which are smaller at maturity; (2) dwarfing rootstocks; (3) large containers that limit the root volume and hence the total size of a tree. The disadvantage of dwarf varieties is that, for some species, they may have a shorter life span, or not be drought tolerant, compared to full-sized trees. Containers are not appropriate for all plants, may severely limit the health or performance of some, and will need more frequent watering. Below are the gallons of water used to produce one pound of harvested fruit per plant. This is a United Nations estimated average for the world as a whole. Usage may be less in some regions. Tree crops consume more water than non-tree crops, and nut crops consume more water than wet fruit crops. It is important to have enough information about the plant you want to buy that you understand selection and cultivation issues thoroughly. Be familiar with your location's climate zone, chill hours, and soil. Choose the microclimate in your yard that is best for the plant. Understand what varieties will do best in your location. Know what fertilizer to use when and what soil acidity level is needed for each plant. Do not plant fruit trees near other trees or large shrubs where their roots may compete. Keep a minimal distance between trees based on the maximum width of the larger tree when mature unless you water every day. Young fruit plants do not compete well with weeds. Weeds should never be allowed to grow under the tree canopy above the roots. Because many plants have shallow roots, using a hoe can damage them if it digs too deep. Pulling weeds by hand to avoid root damage is a safer option. In Western states, the soil is often alkaline and salty. Chemical fertilizers are not recommended. Organic fertilizers with lower salt levels should be used instead. Fertilizers have an NPK ratio label on their containers, such as 10-10-10. The first number is the percentage of nitrogen, the second is the percentage of phosphorous, the third number is the percentage of potassium. The amount to use depends on the first number. If the NPK number is 20-x-x, that contains twice as much nitrogen as a package labeled 10-x-x, and you must use half as much. For many plants, using a high nitrogen fertilizer will produce all foliage and no flowers or fruit. Be careful not to use fertilizers where the amount of nitrogen exceeds the other ingredients unless the plant species specifically needs it. Some fruit trees, such as citrus and those from tropical regions, need micronutrients along with fertilizer. Commercial citrus micronutrient solutions are a good way to provide these. Basin irrigation involves building a circular dirt dike just outside the drip line, and flooding the area with water, deep soaking the soil to an appropriate depth. Double Ring Basin Irrigation is needed when trees cannot tolerate water on their trunk and graft union. For all but a few plants, the soil should dry out at least 6" deep between waterings. Many fruit trees will need soaking in this manner once a week while they are fruiting. There are some fruit trees, however, that are intolerant of flooding, and the amount of water used should drain quickly. Double ring basin irrigation involves (1) building a circular dirt dike one or two feet outside the drip line; (2) building a second dirt dike circle inside the first, one or two feet away from the trunk; and (3) flooding the area between the dikes with water, deep soaking the soil to a depth appropriate to the species of fruit tree. The inner dike avoids getting water on the graft union and causing disease. For all but a few plants, the soil should dry out at least 6" deep between waterings. Most fruit trees will need soaking in this manner once a week while they are fruiting. There are some fruit trees, however, that are intolerant of flooding, and the amount of water used should drain quickly. Drip Irrigation can be used for fruit plants, but there are some guidelines to follow. First, the emitters should circle the plant at the drip line, not at the trunk. It is necessary to encourage roots to grow away from the trunk for wind stability. Second, the emitters should be under mulch, such as straw, to shield the plant's roots from the sun and high summer temperatures, and to reduce evaporation. Third, the emitters should be on a daily timer so the amount of water the plant receives can be regulated, with less water at certain seasons of the year. It takes many leaves to support one fruit, and larger fruit require more leaves. For most Prunus species, remove excess small green fruit so that those remaining are spaced 8" apart. This includes apricot, peach, nectarine, plum and pluot. Other species may also need green fruit culling to provide a proper leaf to fruit ratio. 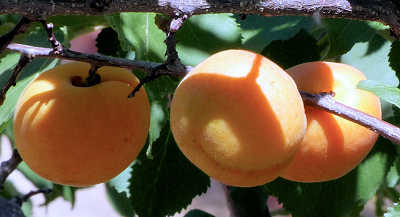 Culling keeps the total fruit load from breaking branches and avoids undersized fruit. Blueberries need short shoots pruned to remove excess berry buds so the remaining berries can grow larger. Strawberries and blueberries need moderate to high soil acidity and consistent moisture. Containers are an easy way to achieve this environment when local soil is alkaline and dry. One caution: do not use concrete containers. They are alkaline and inhospitable to acid-loving plants. Antagonist plants are those that should not be near the plant you are putting in the ground. They may take up the same nutrients as the desired plant, chemically interfere with its growth, or carry the same diseases. Companion plants are those that keep insects away with their scent or those that attract beneficial insects which prey on plant-destroying insects. For example, do not plant blackberry vines where tomatoes, peppers, potatoes or eggplant have grown or are growing. Pear trees need to be far away from apple trees, roses, pyracantha and Bermuda grass. On the other hand, apple trees are helped if you plant chives, marigolds, nasturtiums and/or onions thickly around them as companions. Gnaw guards should be installed around the base of many fruit trees, especially rose family members, to keep rabbits and rodents from eating the bark and possibly killing the tree. These guards can be made of 1/4-1/2" wire mesh, wrapped around the trunk, but not tightly, with the bottom buried in the ground. The guard must be adjusted periodically so the trunk can grow without getting constricted. Plastic pipe or plastic containers can also be used as trunk guards, which should rise at least 10" high above ground. Gopher damage can be reduced by growing a tree in a large, underground metal basket. Irrigated trees need to be in an area surrounded by a stout fence to keep out javelina that like to dig and lie in moist, shaded soil. Trees can also be draped in large bird nets, reaching to the ground, with no openings. To keep rabbits away, grow berries in 18" high raised garden beds or use 18-24" high chicken wire. Young rabbits can get through 2" x 4" fencing. Two methods can be used to protect a plant from frost. One is to pack a deciduous plant in hay bales. Second, place incandescent holiday lights under the tree with a large cloth cover over the entire plant. The lights are kept on when the temperature is below freezing. The cloth must be tucked in at the bottom. Remove the cloth during the day if the plant is evergreen, unless wind chill remains below freezing. Plastic coverings should not be used unless they do not touch the plant. Plastic will freeze the part of the plant it contacts.